For organizations that have a fleet of Apple Macs the question often arises as to whether it is better to use Apple Open Directory or Microsoft Active Directory. Both solutions have a number of similarities and differences that make comparing the two a necessary task when considering how they can be utilized effectively. Currently, directory services is one of the hottest segments in the identity management space. With the move to more heterogeneous infrastructure and the advent of the cloud, the directory services market is changing rapidly. Both Apple Open Directory and Microsoft Active Directory are on-premises software solutions. Both of them have been around for a number of years with Microsoft introducing AD in the late 1990s and Apple introducing Open Directory shortly thereafter. It isn’t hard to guess why each company introduced their own directory services solutions. Microsoft was the undisputed leader in market share at the time and creating a system that made it easier for IT admins to tie users to the Windows systems and applications was hugely beneficial to the organization. It also enabled Microsoft to further lock-in their users. IT admins managing Macs needed something similar to AD to manage their users. Apple Open Directory was introduced for that purpose. For homogeneous networks these two solutions made a great deal of sense. However, IT admins were increasingly challenged when operating in a mixed environment. The introduction of the cloud further complicated the network environment for many IT admins. What was once homogeneous and on-premises, was now turning into a mixed environment with much of the infrastructure being hosted in the cloud. Amazon Web Services (AWS) has pushed the data center from being on-premises to being in the cloud. Web-based applications such as Salesforce and Google Apps made a massive impact on how organizations were handling their directory services. What once was on-premises was now in the cloud and users anywhere in the world could do their work on a variety of devices and platforms. This is where the challenge arises for both Open Directory and AD. While Open Directory works extremely well with Apple Macs, it tends to struggle with platforms and applications in the cloud. AD has the same problems. IT admins are now facing these issues more frequently with the advent of modern cloud forward IT networks. While the only two viable options used to be Open Directory and Active Directory, a new category of cloud directory services has appeared. These in the cloud solutions are not just a hosted or cloud version of Open Directory or AD. The Identity-as-a-Service platforms have been completely reimagined for the cloud era. Today’s networks are heterogeneous, on-premises, and in the cloud simultaneously. Identities need to be highly secured, and the systems need to be constantly available from anywhere in the world. That is not an easy task for legacy, on-premises directory services to accomplish. This new category of solution, Directory-as-a-Service®, aims to securely connect users with the IT systems, applications, and networks that those individuals require. The benefit of a SaaS-based directory services solution is that it is an independent service which IT admins can rely upon to be their core user store. This independence means that admins don’t need to choose between Mac and Windows, on-premises, in the cloud, or high costs when deciding on a solution that suits the particular needs of the organization. 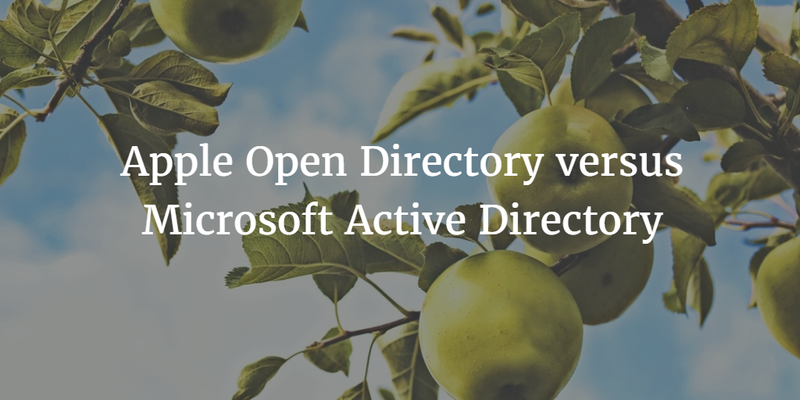 If you would like to learn more about the differences between Apple Open Directory and Microsoft Active Directory and ultimately why a Directory-as-a-Service platform may be the right fit for you, drop us a note. We’d be happy to discuss this new Identity-as-a-Service platform with you. Alternatively, if you would like to try JumpCloud’s DaaS for yourself, please sign-up for a free account.